WASHINGTON — The unemployment rate for veterans who served since 2001 dipped slightly in 2013 to 9 percent, the Labor Department reported Thursday. That’s down from 9.9 percent the year before, but well above overall civilian unemployment levels of around 7 percent over the same period. The youngest veterans, aged 18-24, posted an ultra-high jobless rate of 21.4 percent, said the agency’s Bureau of Labor Statistics in its annual review of unemployment among former members of the armed services. The report documents that, despite training and job skills acquired in the military, young veterans of recent conflicts have generally encountered more difficulty in finding work than civilians. “Veterans have the skills that employers are looking for. They make our nation’s workforce more productive, our companies more profitable and our economy more competitive. Smart businesses recruit veterans because it’s in their self-interest, because they know it’s a sound investment in their bottom line,” Labor Secretary Thomas E. Perez said in a statement. Veterans with the highest jobless numbers served in the military after the Sept. 11, 2001, terror attacks. For all veterans, the unemployment rate was 6.6 percent in 2013, down from 7 percent the year before. That’s not markedly different from overall unemployment levels in the United States, which averaged 7.4 percent in 2013 and finished the year with a 6.7 percent rate for December. The most recent overall unemployment rate was also 6.7 percent in February 2014. “Those in the youngest group are experiencing unemployment at a higher rate than their nonveteran peers,” said Teresa W. Gerton, deputy assistant secretary for policy in the department’s Veterans’ Employment and Training Service. The economy is still digging out from the 2007-2009 Great Recession and it will likely be some time before overall unemployment returns to pre-recessionary levels of 5 percent or lower. 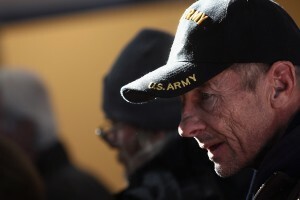 Twenty-nine percent of veterans serving since 2001 reported having a service-connected disability as of last August, compared with 15 percent of all veterans. In 2013, 21.4 million men and women, or 9 percent of the general population age 18 and over, were veterans. Veterans who served during World War II, the Korean War and the Vietnam era accounted for roughly half of the total veteran population in the United States of 21.4 million men and women. The unemployment rate for recent veterans has been noticeably higher than it is for non-veterans in the same demographic group, although the gap has been narrowing. States with the highest unemployment rate among veterans were Michigan and New Jersey, both with over 10 percent. States with the lowest rates were Delaware, Iowa, North Dakota, Vermont and Virginia, all under 4 percent. The new numbers came out a day after President Barack Obama presented the Medal of Honor to 24 Army veterans in recognition of their valor during major combat operations in World War II, the Korean War and the Vietnam War. The annual report was compiled by the Labor Department with the help of the Department of Veterans Affairs. Among all of the veterans, the unemployment rate for women declined to 6.9 percent in 2013 while the rate for men edged down to 6.6 percent.